Providence, RI (7/3/2018): The late Ray Ross, a native son of Hamilton, Ontario, will be memorialized when his family unveils and presents the first annual "Ray Ross Memorial Award for Perseverance in Hockey" at the Rhode Island Reds Heritage Society's 18th annual reunion in Warwick, RI on August 5. Sons Gary, Glen and Gregg will make the presentation to former Reds center Willie Marshall, the American Hockey League's all-time leading scorer. "Our dad lived in virtual hockey anonymity," says Ross' son Gary. "He never really got a chance for a serious tryout in the old six-team National Hockey League but he never complained. All he wanted to do is play hockey. Playing pro hockey for 14 seasons in the minor leagues demonstrated his own perseverance and love for the game. That's why our family is presenting this award in his name." Ross spent 10 of his seasons with Providence and scored 20 or more goals as a speedy right winger in three consecutive seasons. 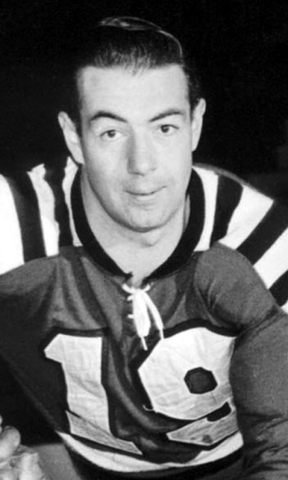 He was a part of three Calder Cup championship teams - two with Cleveland, the last with the Reds in 1955-56. His hard work and dedication to the game made him a fan favorite in Providence. Marshall, despite racking up all-time offensive stats in the American Hockey League, was also virtually overlooked by the NHL -- He played in only 19 big league contests in his 20-year pro career. But he like Ross never complained. Instead he served 20 seasons in the AHL where he played the most games (1,205), scored the most goals (523), had the most assists (852), and tallied the most points (1,375). The first annual Ray Ross Memorial Award for Perseverance in Hockey has a deserved recipient in Willie Marshall. Members of the Ross family have been regular visitors and guests on an annual basis to thesociety's reunions since 2001. Ray Ross spent 10 of his seasons with Providence and scored 20 or more goals as a speedy right winger in three consecutive seasons.